Whether in the showroom, on the street, or at the junkyard "bullet nose" Studebakers make snazzy subjects for photography, drawing, and painting. 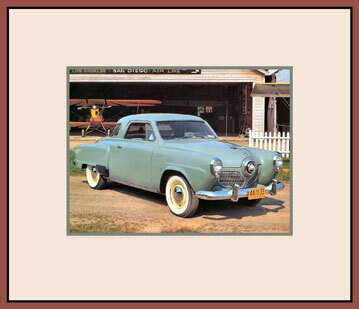 The "bullet nose" front end combined with the wrap around rear window of the postwar years earned a populist tag, "Which way is it going?" Images are shown here augmented by Photoshop techniques to enhance the images and enrich them with complimentary matboards and frames. Open the Bullet Nose Gallery Only 1950-1951 "bullet nose" Studebakers are included in this gallery. The 1952 Studebakers lost the "out of this world" styling and served as a transition to Robert E. Bourke's classic 1953 Commander Starliner Hardtop. In addition to this special "bullet nose" gallery the main Avanti Art Gallery includes the Avanti as well as Studebakers and related automotive subjects. A "Bullet Nose" Champion at a rural airport. 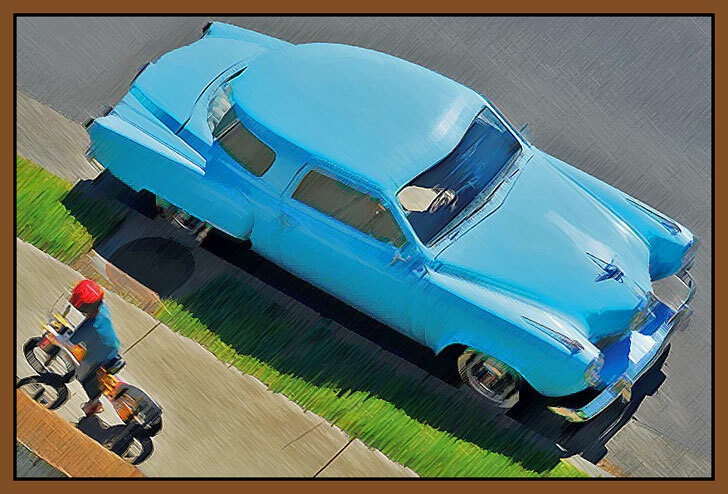 "Street Smart", Electronic Art of the "bullet nose" 1950 Studebaker Champion from above.